Rift Labs have started a crowd-sourcing project to launch their pocketable Kick WiFi LED, which can emit any colour of light. Rift Labs have started a crowd-sourcing funding project to help launch their Kick LED, a pocketable lamp able to match any colour of light and controllable from an Apple iPhone. Through the Kickstarter web site, Rift hope to gain US$150,000 in pledges so that they can bring their product to the mass market. The firm believe that the concept represents “the new generation of lights for photo and video”. The Kick Basic will have user-selectable colour temperature and light intensity, while the Kick Plus model will add WiFi control, allowing you to “stream light” through your iPhone or pick any RGB colour for the LED to match. The simpler Basic version is expected to cost around $100 while the more advanced Kick Plus will be priced at $150. Though originally designed for primarily professional applications – a bit like the Rotolight Anova WiFi LED – Rift Labs are now aiming for a wider market including social photographers, families and cameraphone users. To do this, the Kick is much smaller and more affordable than their original prototypes so that it can appeal to amateurs and experts alike. 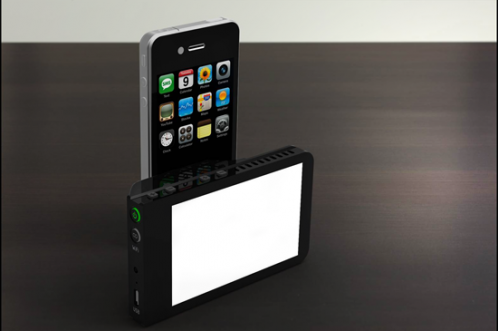 The lamp is about the same size as a mobile phone and can be handheld or mounted on a tripod. By incorporating an “RGB” LED array, the Kick would effectively make gel filters for colour correction and creative effects redundant, since it is possible to pick the output colour digitally. This includes sampling colours using your iPhone camera and having the Kick replicate them, or setting up a programme over time to recreate the effects of a campfire, gunfights or a thunderstorm. According to the company, the Kick’s built-in battery will be able to last four to five hours or more. It won’t be user-replaceable but you will be able to recharge it using a USB cable, just like you do with your iPhone and other portable devices. There is no Android support yet, but there is an API allowing developers to make their own software. In order for the Kick to become a reality, the firm want to raise $115,000 by 18th July 2012. For more information, visit Rift Labs’ Kickstarter project page.